Vital to Commercial Window Cleaning in London is the Bosun’s Chair. There’s no way you’d be able to clean all the windows on all the tall glass fronted buildings in Central London without one. Here at Millards Cleaning Services our Window Cleaners probably spend more time sat in a Bosun’s Chair than anywhere else. Even the pub! The Bosun’s Chair originated in the Navy. A Boatswain is a warrant officer in the British or US Navy, or a subordinate officer in the merchant navy, responsible for most things that happened on the deck of a boat. 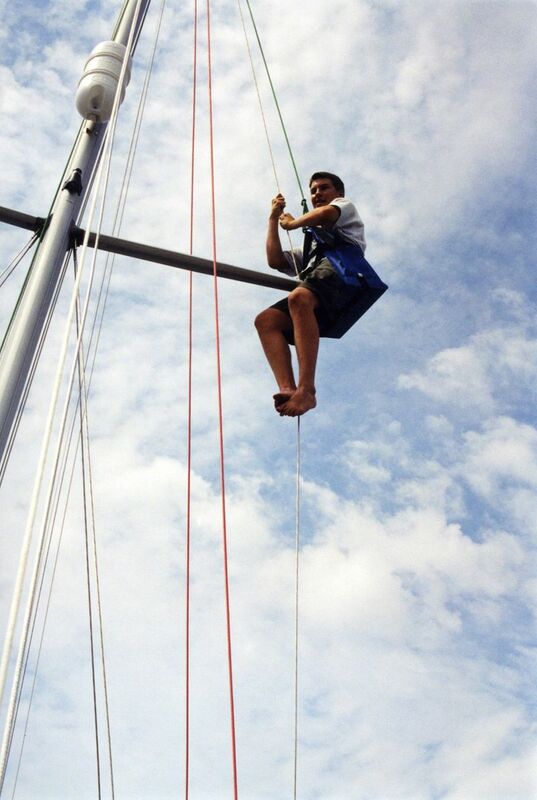 A Bosun’s Chair was originally designed to haul a sailor up the mast on a halyard to do repair work or inspect the rigging. The first chairs were simply wooden planks with stout lines passing underneath it and up into a bridle at chest level. Early versions suffered from having no back support meaning that sailors would have only one hand to work with, the other holding on for dear life so you didn’t fall backwards out of the chair. Nowadays, fabric chairs are most common, with comfortable backs and padded seats for today’s pampered derriers. It’s virtually impossible to fall out of one now, leaving both hands free for work. Some models even have tool straps and built in pockets tailored specifically for the needs of the user. Our Window Cleaners have room for their squeegees, buckets, and chamois leathers. Everything they need to clean the windows of any building in London. 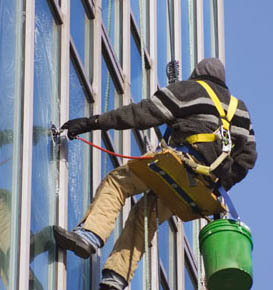 If you need Office Cleaners or Window Cleaners in London, look no further than Millards Cleaning Services. Established in London in 1919, and based in Covent Garden, Millards Cleaning Services offer you professional, highly trained Office Cleaners and Window Cleaners at a competitive rate. London Office Cleaning Companies could reap the benefit from plummeting office rents according to a recent survey by Office Genie. 25,000 office spaces were canvassed and the average rent had dropped to an average of £122 per desk in September, compared to £139 in June. Office Genie reckon that this could lead to more businesses upping sticks and moving to newer, and bigger properties, allowing for more opportunities for cleaning companies to do their dirty work for them. But the future seemed brighter for Office Cleaners in London more so than elsewhere. Rent for office space in Manchester, Birmingham and Leeds all maintained a steady average over the same period, suggesting office cleaners in those cities would not benefit from the fall in rental prices. If you’re moving offices, and are looking for a reputable Office Cleaning Company in London, look no further than us at Millards Cleaning Services. Visit our website for a free quote. Window Cleaners in London will reportedly get the best seats in the house for the 2012 Olympic Games next year. Sheffield firm Rostek-UK have installed a monorail system that will carry two powered cradles around both towers at Pioneer Point in Ilford. The equipment, that will carry two people responsible for cleaning Pioneer Point’s windows and facilities, cost £200,000, and was designed to allow window cleaners access to all the windows on the 33 and 25 story buildings. Rostek-UK won the contract and was appointed by London and Regent Construction with the specific brief to allow cleaning companies to be able to access all external parts of both towers. The monorail system will negotiate a number of tight bends and vertical section, with two self-hoisting cradles running alongside. Among the other views available to any intrepid window cleaners are Canary Wharf, St Paul’s Cathedral and The Gherkin. This year, Millards Cleaning are celebrating 90 Years of serving Central London. “We’ve been going since 1919, so we have seen several recessions and a depression. The current situation has the characteristics of a depression – not a recession – and my guess is that it will last for four years.